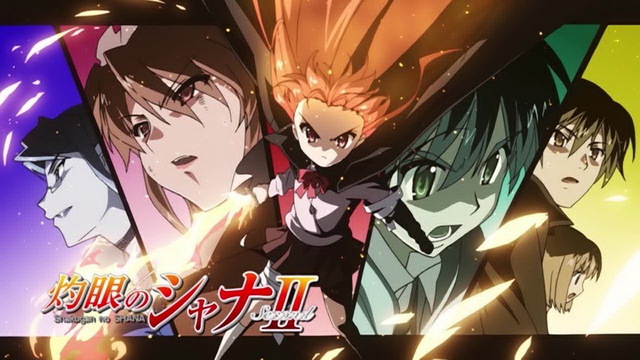 “Before we even know, our world has been swallowed by the fire of Guze….” is the prologue of the first season Shakugan no Shana (Shana The Red Flaming Eyes). This story is adapted from the novel with the same name, which has been sold over a million in Japan. It told about their world that have been invaded by people from Guze, a parallel world, who use humans “flame of existence” for their own personal gain, and by doing it, they disturb the balance of existence in both world. More sadly people who have their flame of existence out will be forgotten, as if they never exist. To reduce the effect, they create temporarily the people who disappear with “torch”, a replacement that slowly burns out. But it can’t replace the lost existence and so the Kings who aware of the disturbance effect start sending “hunters”, people who bond a contract with them, to hunt those destructive “Guze no Tomogara” who abuse the flame of existence. The story begin with Sakai Yuji, one day while he was in the middle of the Misaki City, the world around him turns into red and time seems like stopping. In the middle of the paralyze world suddenly two monsters appear and start absorb the people flames, and also one of his friend Hirai Yukari. Realizing that the boy can still move the monsters know that he is not ordinary and start chasing him, suddenly appear a girl in a black robe with red flaming hair and eye with a katana. Along the battle Yuuji start to realize that he actually already dead before and become a torch, not ordinary torch though a “Mystes”, inside of his torch laying an extraordinary “Hougou”, an artifact that created by the Guze. And so their adventure begin. I love this series, I already watch the first season three times and still found it exciting, the action, the giddy romance, and the importance of existence. And starting from fall 2007, the second season start to air in Japan. The second season starts fast but then really slow, maybe because I didn’t read the novel (no translations currently), but looks like since episode 13 this show start to pick up the pace. As previous review I’ll start from the current episodes, actually this is a week late but the next subbed episode haven’t popped out yet so there’s nothing to lose.